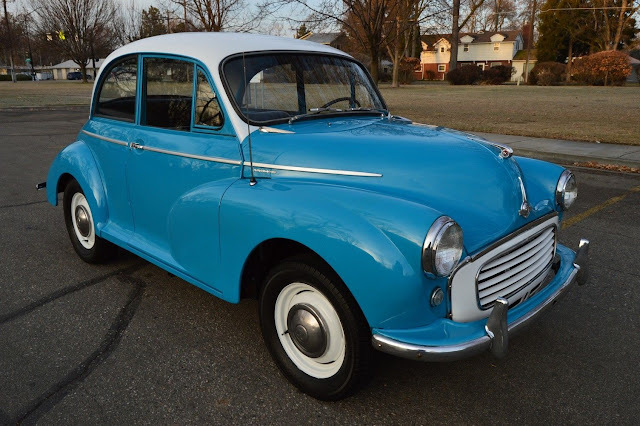 Check out this 1959 Morris Minor 1000 Saloon here on eBay bidding for $7,250 reserve-not-met with auction ending Monday at 7:00PM PST. 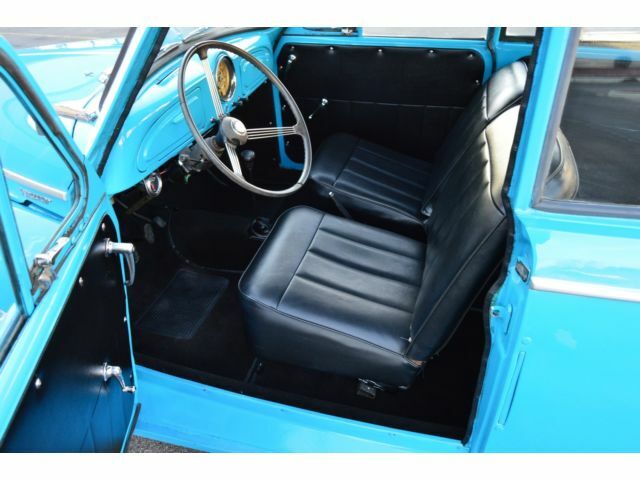 Take a look at this BEAUTIFUL - RARE - SURVIVOR - LOW ACTUAL ORIGINAL MILEAGE - 1959 Morris Minor 1000 Two Door Saloon !! Do not let this one get away ! This would look great in your garage AND I would venture to say that you would be the only one in town that has one !! It only has 43,812 ACTUAL - ORIGINAL MILES since it was brand new and yes we do have an odometer statement !! You can now own a NICE Classic British Touring car that is getting hard to find !! This is a GREAT example of the Beauty and Style of the British passenger cars of the late 1950's. We recently purchased this Morris Minor 1000 from the older Arizona gentleman who had owned this BEAUTY for the last several years and as you can clearly tell in the pictures and video this was his pride and joy for sure !! This Morris Minor is a NICE - DRY - Arizona - Idaho High mountain desert - Western vehicle and boy does it show !! It still retains its - FACTORY ORIGINAL - firewall mounted data plate which is shown in a picture below. I drove this car for the last several days as my every day driver to and from the office and running errands as needed and I can assure you it runs and drives well. It has good get up and go and awesome gas mileage, what is not to like? If you can make it to Boise in the next ten days please come look at and drive this car for yourself, you won't be disappointed !! This is a QUALITY CAR THAT IS READY TO ENJOY !! At the heart of this BRITISH BEAUTY is the STRONG - APPEARS ORIGINAL - FRESH PROFESSIONALLY REBUILT - "A Series" 948 CC - Inline Four cylinder motor that is running VERY WELL indeed. The recent down to the bare block professional rebuild included a NEW crankshaft, NEW rod and main bearings, NEW piston rings, NEW gaskets and seals and a NEW rear main seal, etc.. . 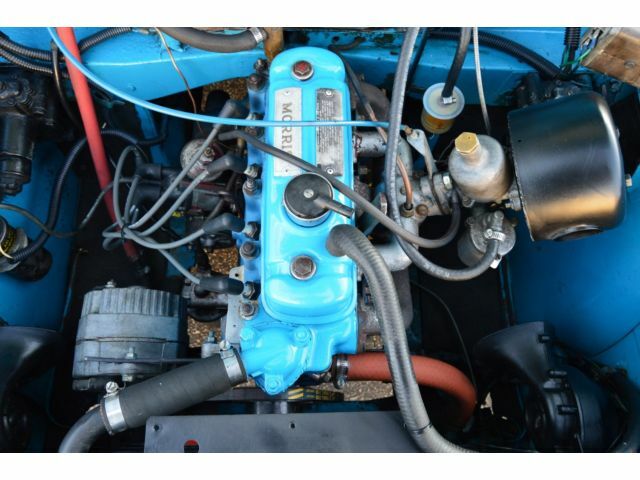 The motor also sports the ORIGINAL intake manifold, ORIGINAL exhaust manifold, ORIGINAL "Morris" scripted valve cover, ORIGINAL "SU" carburetor, ORIGINAL air cleaner housing and an electric fuel pump. Sounds good too with the factory style exhaust system with chrome tip. The engine is backed by a SMOOTH - four speed manual transmission which also functions well. The BEAUTIFUL - Black Vinyl bucket seat interior is in GREAT condition with VERY NICE Black Vinyl front bucket seats, VERY NICE Black carpeting, VERY NICE Matching Black Vinyl door panels, good ORIGINAL Morris steering wheel, VERY NICE Matching Riviera Blue dash, VERY NICE ORIGINAL Factory gauge cluster, VERY NICE Black vinyl rear bench seat, Good White Vinyl headliner and a VERY NICE ORIGINAL White Vinyl driver's sun visor. All of the ORIGINAL black rubber weatherstripping is soft, supple and in good condition for being original. This Morris Minor 1000 is nicely equipped including factory wing windows, factory electric power wipers, factory gauge cluster with 80 MPH speedometer, good heater and defroster, original rear view mirror, original chrome driver's side view exterior mirror, front and rear turn signals, factory "trafficator" turn signals which are no longer working and the factory manual choke pull knob. 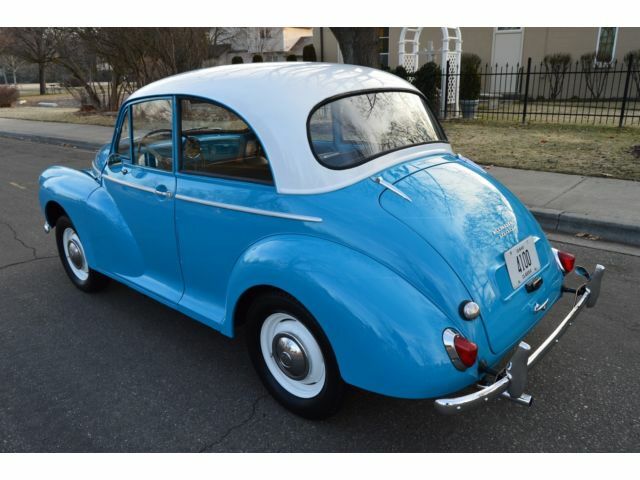 This is a great running, wonderful looking and RARE Morris Minor 1000 that has sharp looks, good power and good gas mileage as well ! These vehicles have an appreciative group of owners any of which would be pleased to own this one. The suspension and drive train are all in good working order as well as the electrical system. All of the lights work including headlights, taillights and front and rear turn signals. All of the ORIGINAL light lenses and reflectors are clear, bright, and BEAUTIFUL !! The CLEAN - SOLID trunk also sports a NEW black carpet liner. This Classic Morris Minor is SHARP !! This ride is a great investment opportunity and it is priced right ! It is in GREAT condition from top to bottom and from front to back. It will not disappoint someone looking for a good example of a sought after and VERY hard to find British collector car which is not seen at every stop light for sure. If you have been looking but cannot find a Classic British Touring Car worthy of your hard earned money look NO further because this is the one ! The Riviera Blue and Old English White exterior finish on this vehicle is EYE POPPING BEAUTIFUL showing several small chips that we touched up and several imperfections but is still bright and shiny and looks BEAUTIFUL as you can clearly see in the video above and 100 ADDITIONAL PICTURES BELOW !! What a STUNNING color combination, is there any better for a British sports car? All of the ORIGINAL chrome and stainless steel exterior body trim and moldings are in good condition including NICE ORIGINAL Chrome front and rear bumpers, Good ORIGINAL Chrome front and rear bumper guards, NICE ORIGINAL Badging, NICE ORIGINAL Grill & Chrome headlight surrounds and NICE ORIGINAL Chrome Morris hood ornaments !! Check out the AWESOME FACTORY ORIGINAL Morris Minor Stainless Steel wheel covers and a set of Good steel belted radial tires, boy does this combination look OUTSTANDING on this Morris Minor and really retains that clean "factory original" look. This vehicle is in nice mechanical condition and it runs and drives well. It is solid with respect to the overall mechanical condition as well as the overall cosmetic impression. Again this is a NICE - DRY - Arizona - Idaho high mountain desert - western vehicle and it shows !! Please pay close attention to the picture and video above and the 100 ADDITIONAL PICTURES BELOW and this description as they will answer most if not all of your questions. If you would like to speak with me my name is Ross and my telephone number is (208) 866-4055 or you can email if you prefer. As always I tried to get as thorough and in depth with the photographs as possible. We prefer a bank to bank wire transfer of funds as payment for the car but we will also accept a bank cashiers check (US only) or a third party check but we will validate the checks authenticity and the funds must clear our account before the vehicle or the title to the vehicle is released to the buyer or the buyers agent. We do not accept paypal. This vehicle can be had for quite a bit less than what it is worth all for the need of a quick sale. Be careful to not let it get away and please enjoy the auction. This is one BEAUTIFUL - RARE - SURVIVOR - LOW ORIGINAL MILEAGE 1959 Morris Minor 1000 Two Door Saloon which needs a new owner...is it YOU ?! Feel free to review our large amount of Ebay feedback and see all of our previously satisfied auto buyer responses. We have been selling Classic Vehicles to buyers all over the world on Ebay since 1999, 17+ years ! Please do not bid on this auction unless you are serious. CHECK OUT THE VIDEO ABOVE AND THE 100 ADDITIONAL PICTURES BELOW ! !